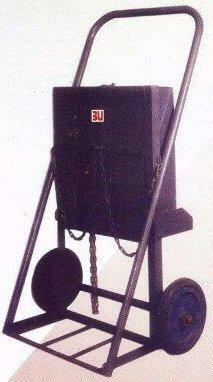 ‘BU’ Brand Cylinder Trolley capable for carrying Oxygen and Acetylene Gas Cylinders. Fitted with a Tool Box for carrying Welding Accessories, like Cutting and Welding Blowpipes, Oxygen and Acetylene Pressure Regulators, Welding Rubber Hoses, Spanners, Gauntlets, Spark Lighters, Welder’s Brushes and other required Tools etc. The Trolley shall be stable when stationary with the cylinders in vertical position. Construction of the Trolley is too robust having load carrying capacity more than 2KN load. It is most essential for welding and cutting in workshop.